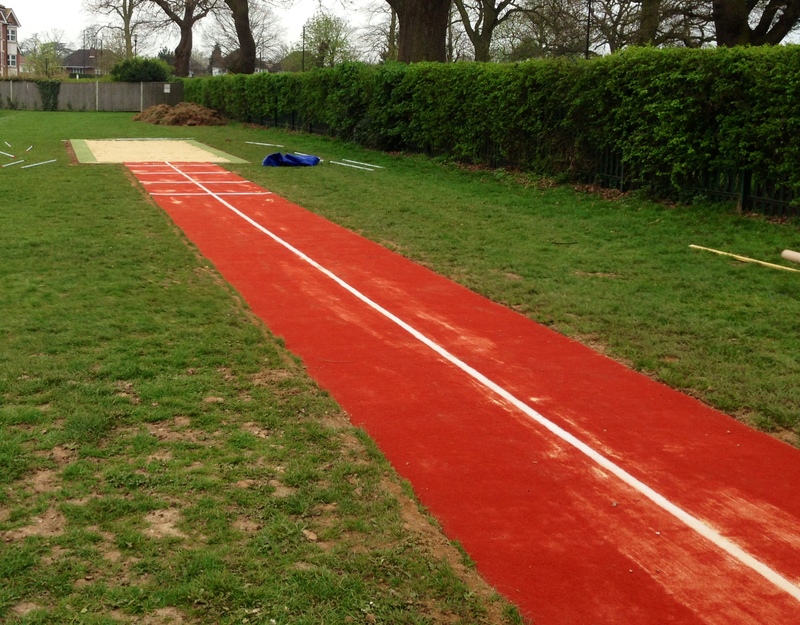 We can supply and install triple jump surfacing in a number of designs and specifications, and our team have worked with many clients across the UK. These facilities are commonly found on school sports fields, as well as at leisure centres and professional athletics clubs. The surfaces used can vary depending on the level of usage, and depending on whether the area is for recreational training or professional competitions. You can speak to one of our experts today if you’d like more information about the range of products that we install. Plenty of design options are available and you can even customise the colour of the flooring to suit you. Just fill in our contact form with the details of what you’re looking for and we’ll get back to you as soon as possible with a quote. 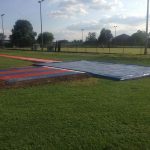 There are a few different options for triple jump surfacing which you can choose from when you decide to have one of these facilities built. 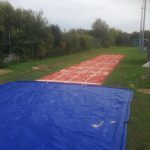 The first surfacing option is polymeric rubber, this is made from EPDM rubber crumb which is mixed together with a binder and laid onto a sub base to create the runway. 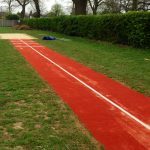 The polymeric rubber surfacing is the most popular for professional athletics clubs and schools where older children are taking part in athletics. The other surfacing option which you can choose from is needlepunch synthetic turf surfacing, this fibre bonded material is idea for primary school athletic facilities as it provides a softer landing surface than the traditional polymeric rubber. The needlepunch synthetic turf triple jump surfacing can also be installed in a range of bright rainbow colours which makes it even more suited to primary school children and makes sport more fun and exciting. Fitting smaller and much more cost effective sports facilities has started to become common within the UK for establishments planning to give beginner’s level chances. 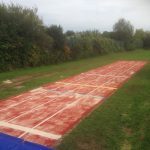 Many colleges are finding it difficult to renew their athletics facilities for many activities like triple jump, meaning that children are unable to take part in these types of sports. This could be due to a limited spending budget or not enough outdoor space for the school to construct on. 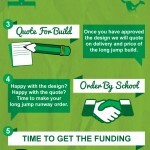 Styles and specifications could be adjusted to match different spending budgets and needs. They are also designed to improve the FUNdamental sports motion skills of running, jumping and throwing. By building various athletic features, kids are capable of getting involved in a multitude of activities for a far more diverse encounter. Some of the popular selected facilities consist of shuttle run tracks, discus areas and even jogging tracks. More often than not a single track can be utilised for multi-use sports with different activities such as relay races, triple jumps in addition to bleep tests. This can be perfect for academic institutions where there isn’t adequate space for the standard 400m circuit. One good reason why having a multiple sports area installed is advantageous for the children is simply because it allows them to discover various activities and find one they enjoy, which may direct them to even more possibilities later on. There are not very many facilities which are aimed at people at entry level, which makes young children unwilling to be involved in athletics. It is recommended for kids to take part in particular sports at a young age – Key Stage One and Two – and carry on during Key Stage 3 and Key Stage 4. A new set of criteria has been created by UKA to ensure that athletics areas are more available to young people. The new model could be installed in vibrant colours to catch the attention of young children and is more cost effective, which makes it a great basic level athletics facility for academic institutions. For organisations with a low spending budget in addition to external space, the compact facilities make a fantastic option for teaching simple FUNdamental skills in a range of sports activities. A lot of establishments tend to get triple jump runways along with high jump fans put in for their compact athletics facility. We can tweak measurements and sizes of each and every construction to meet the space on site. 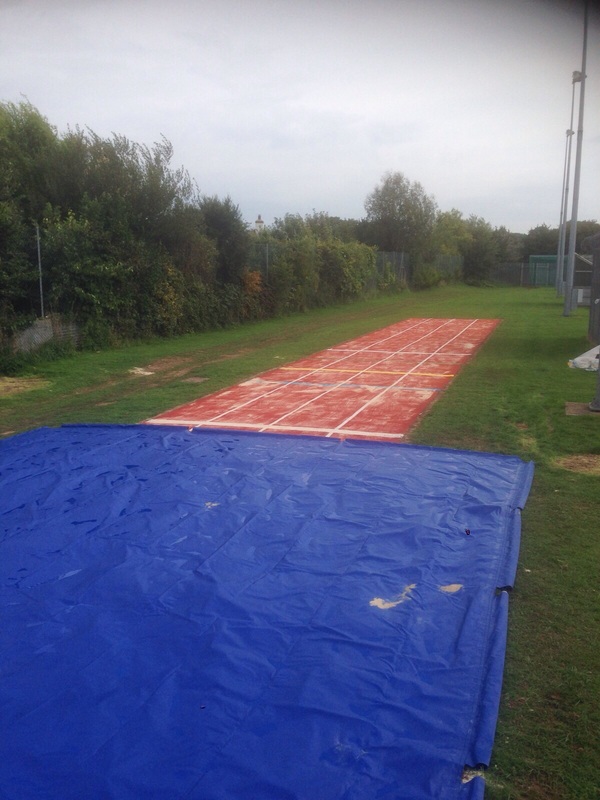 A number of customers can utilise a compact athletics facility due to the specs being so flexible and unique. Colleges, universities, primary along with high schools are able to set up these to enhance present sports activity and play provision. Kids of each key stages may be helped by self improvement when studying additional skills through the diverse sporting activities. A primary reason you will need to improve your sports facility would be to encourage young children to participate in these kinds of sporting activities. Compact facilities are a reasonably-priced alternative available to any type of school or athletics centre. Compact facilities help to bring in the FUNdamentals of athletics so children can develop basic skills of motion as well as physical activity. 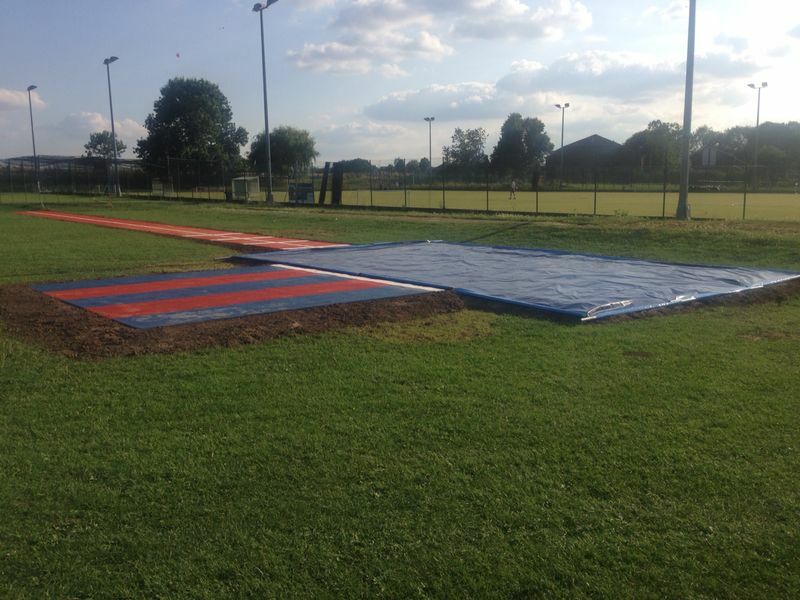 You can see our team installing a multi use triple jump facility in the video below. 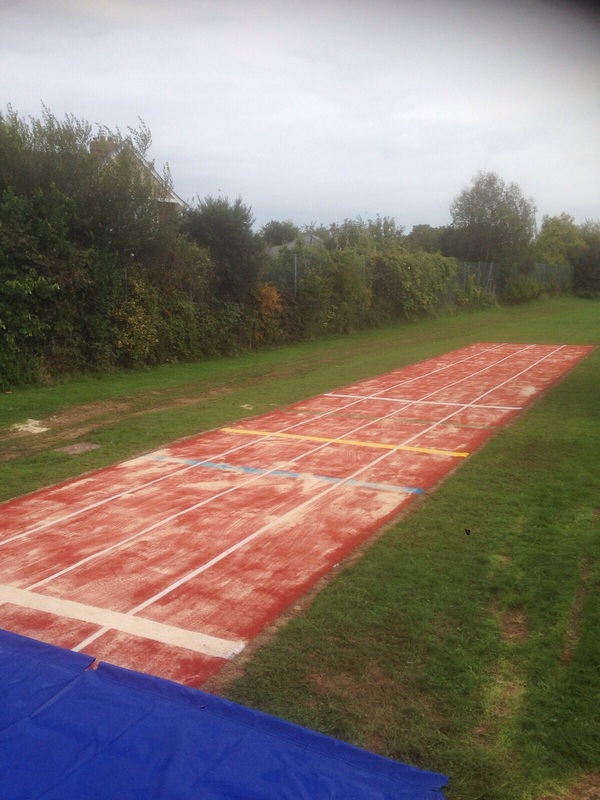 This featured a practise run up track and a full sized one for use in training and competitions. The main objective for UKA is to inspire children and young people to engage with sporting activities and athletics, which is the reason these types of facilities are valuable. Considering the IAAF and IPC World Championships are going to be hosted in London in 2017, it is likely more and more young people will begin to get involved. When using these compact sports and athletics facilities, kids might find a certain activity they enjoy and might join a qualified club – helping to better involvement in athletics. 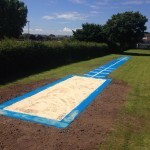 The costs for installing triple jump surfacing can vary depending on a number of factors including the size and dimensions of the runway and sand pit, the existing conditions of the area and the site location. We can offer you a flexible quote and help you design a facility specification which suits your requirements and still fits within the budget for your organisation. Our aim is to provide top quality products and services at a great value price to suit a range of budgets for schools and clubs throughout the UK. If you’d like to find out more about these different products and services, feel free to speak to our team and we’d be happy to answer any questions. Every project can vary depending on sizes, location and the chosen design, but we’ll try to make sure the costs are affordable for you.